The HangUps Upper Cabinet offers versatility for your ever changing storage needs in the garage, laundry room, office or workshop. The Upper Cabinet mounts securely to the wall with a heavy duty metal rail and hook system. The wall mounted feature ensures easy cleaning beneath the cabinets and protects your stored items from water and dirt. The HangUps Collection is constructed using laminated composite wood and features metal handles and adjustable hinges. This product ships ready-to-assemble and includes all hanging rails and fastening bolts. The Madison 28 in. X 36 in. poplar wood framed mirror cabinet features a contemporary White finish and a simple clean design. Two glass shelves are included easy storage. It matches with the Madison collection a coordinated look and includes mounting hardware easy installation. The Gladiator. 28" (71.1 cm) Full-Door Wall GearBox is ready to hang out in your garage. The included brackets lets you hang it up and reposition it on Gladiator. Wall Systems wherever you need it most. Store smaller automotive, gardening or paint supplies, keeping them out of the way but within easy reach. Expertly crafted and built to last, the Liberty Storage Cabinet is the perfect blend of Mid-Century design and modern functionality. A transformative piece that will complete and instantly elevate a space, the cabinet features one full extension drawer, doors that conveniently open at ninety degrees, and three concealed storage areas to stow away dishes, flatware, and other favorite items. Metal handles and splayed legs play on the Mid-Century timeless design and are versatile to blend well with any existing decor. 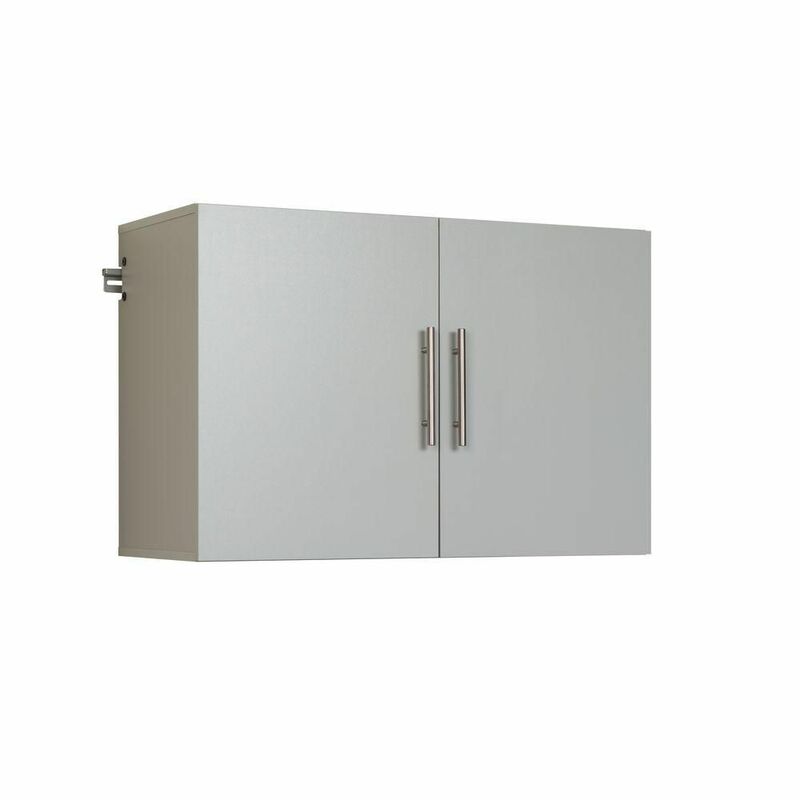 HangUps 36-inch Upper Storage Cabinet in Light Grey (36 inches W x 24 inches H x 16 inches D) The HangUps Upper Cabinet offers versatility for your ever changing storage needs in the garage, laundry room, office or workshop. The Upper Cabinet mounts securely to the wall with a heavy duty metal rail and hook system. The wall mounted feature ensures easy cleaning beneath the cabinets and protects your stored items from water and dirt. The HangUps Collection is constructed using laminated composite wood and features metal handles and adjustable hinges. This product ships ready-to-assemble and includes all hanging rails and fastening bolts. HangUps 36-inch Upper Storage Cabinet in Light Grey (36 inches W x 24 inches H x 16 inches D) is rated 4.5 out of 5 by 22. Rated 5 out of 5 by Geno from The unit was easy to assemble and mount. Mounting was quick and accurate. It looks nice. It se... The unit was easy to assemble and mount. Mounting was quick and accurate. It looks nice. It seems to be very sturdy. Rated 5 out of 5 by Michael from Arrived in a timely manner. Pickup wasquick and easy pick.... Arrived in a timely manner. Pickup wasquick and easy pick. Assembly instructions were clear and the company's website videos made it even easier to put together. Nice looking at a reasonable price. Rated 5 out of 5 by RonAvery from I bought 3 24wx30hx12d and 3 36wx24hx16d and 2 30wx24hx16d to put in my office which was way too ... I bought 3 24wx30hx12d and 3 36wx24hx16d and 2 30wx24hx16d to put in my office which was way too small and all the floor space was taken up with book shelves and equipment leaving no room to use my desks. So I needed some wall hung shelves that I could put up quick and without moving the cramped desks and equipment. So I installed these HangUps very quickly by installing the metal rail and hanging the selves one at a time without moving a single piece of furniture or equipment. I bought one 2x12 board 8 feet long and set it over my two floor book shelves spanning across one of my drafting tables to install the shelves on one wall and simply used a step ladder to install the HangUps on the other wall. And I did it all alone without any help. They also come in small flat easy to transport boxes. And I have some great flat sheets of styrofoam packing left over to use in making styrofoam models. I left the doors off all but one unit since I need to see what I have all the time any way. One negative: the 30wide units need a center vertical support as 30 inches is too long a span and the shelves visually sag. The 36w units do not sag because they have a center support at 18 inches. But over all I love them and how easy they are to install. I will recommend them to one and all. Sincerely, Ronald F. Avery Texas Architect #09285. Rated 1 out of 5 by Pepper from I would like to rate this product but we cannot hang it up. Some of the screws were missing for ... I would like to rate this product but we cannot hang it up. Some of the screws were missing for the hinges and we have been unable to get them from Home Depot or the vendor. I may return the whole thing for my money back. Is there a corner cabinet available to match these? No, there is not a corner cabinet in this line.